Escape Plan is a band that has, since their emergence in the late aughts, has been a favourite of mine. Their unabashed love of hooky pop was a breath of fresh air from the darkness of most of their fellow yaogunners; their good-time live show inspired, in this fan and those around me, a renewed excitement about the gig-going experience. Their language choices, though, inspired different feelings. Their needs-improvement English lyrics in some, not all of their songs, take away from the experience. Exhibits A through Z: Mao Chuan’s intense and emotional delivery of lines like “Yellow apple, green apple, red apple/The colourful apple/Beautiful apple, imperfect apple, pure apple.” It’s not that I’m seeking meaningful lyricism, or dissing on love-songery—because EP is all about the latter, which often involves the former. I am, though, in general, opposed to lyrics devoid of meaning, syntax, grammar and logic—particularly in the context of being so obviously, and earnestly, into what one is singing. The band has had a relatively quick rise through the underground, in no small part thanks to their management, who are also behind the also-successful Mao Livehouse, the Beijing and Shanghai live venue, and the band has won a large and loyal following. Their newest fan, though, was something of a surprise. In May, during their set at the Midi Festival’s Shanghai installment—they were closing the first night at one of the festival’s two main stages— a surprise awaited the band. At the end of their first song, that aforementioned newest fan ran onto the stage. Huang Shujun, a pop singer and “dean” of the “Idol Institute” run by the folks at Chinese Idol (中国梦之声). Huang told both the gathered crowd—from whence did come shouts of “get off the stage!“—and lead singer Mao Chuan that he had a surprise to share. A “Wild Card”—an invitation for Mao (not EP as a band, but its singer) to appear on Chinese Idol‘s Beijing stop, which he handed to Mao. Below, a clip from Idol, on which Mao Chuan sings “The Brightest Star in the Night Sky,” a tune that appears on Escape Plan’s 2012 album Earth (though the Chinese title, 世界, implies “World,” we’ll have to accept the official translation). What is evident, as always with yaogun’s baby steps into the mainstream, is the great gulf betwixt the two. Huang Shujun’s appearance, for example, in the middle of a band’s set at a festival that is notorious for delays (and whose audiences’ passive-aggresiveness about said delays often wind up more aggressive than passive), and in front of an audience there as much to see Escape Plan as they were to see metallic rockers Miserable Faith or Yaksa—the latter of which had preceded EP—belied a real ignorance of the state of affairs. Which is not to say Idol watchers don’t attend Midi Festivals. Rather, it is to say that Idol isn’t going to draw new fans at Midi. Would Simon Cowell saunter up on stage during a Warped Tour stop to invite the singer of a band onstage to appear on his show? One is also reminded of yaogun’s early days, back when Rock Records/Magic Stone—the Taiwanese label that made the first generation of yaogun stars—wanted singers not bands. Idol and The Voice are certainly not about collectives; they are about the guy or girl holding the microphone. The good news, though, is that, in Mao Chuan, we see a yaogunner making an honest effort at bridging that misunderstanding. His performance on the show was great, despite the obstacles, from the quip from the welcoming committee to the band that it was clear by their haircuts that they were “a gang.” There were the judges: Asked his occupation, Mao replied, “yaogun.” “So you like yaogun a lot,” was the retort from the bench. “I have to,” said Mao, not flipping the bird or walking off the set. At the end of his song, head judge Wang Weizong says, simply, “Rock isn’t dead,” but one gets the impression he’s less than genuine. 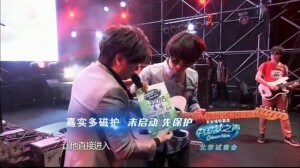 The good news: i) The singer of the Voice version, Zhang Hengyuan, seems to be actually playing the guitar he is holding; ii) the credit for the song, in the millisecond one is granted at seeing it, is to Escape Plan the band.